Matthew Lyon's first infraction as a politician was essentially a failed delivery. A member of the Vermont state house of representatives and clerk of the Court of Confiscation, he was impeached in 1785 for refusing to bring records to the Council of Censors. The request had been made by a Tory contingent in the house, which was seeking compensation for lands seized during the American Revolution. In addition to the impeachment, Lyon was reprimanded and fined 500 pounds for never showing up for the trial. Once these penalties had been imposed, Lyon requested a new trial, and one was granted. Whatever happened next is lost to history, but events worked out in Lyon's favor. The trial never occurred, but the impeachment was rescinded, the fine remitted, and the reprimand withdrawn. It wasn't the first time that Lyon had managed to escape trouble unscathed, and it wouldn't be the last. Lyon was born in 1749 in County Wicklow, near Dublin, in Ireland. There, he attended school and began training to be a printer. In 1765, when he was 15, Lyon took a ship for the British colonies in America. A biography by James McLaughlin says that Lyon was supposed to receive free passage because he worked as a cabin boy during the journey, but was betrayed by the captain upon his arrival and sold into indentured servitude to pay for his passage. He worked on a farm in Woodbury, Connecticut, before his master traded him for a pair of bulls. Until the end of his life, one of Lyon's favorite sayings was, "By the bulls that redeemed me." After fulfilling his debt, Lyon remained in Connecticut for a time and in 1774 moved to Wallingford in the New Hampshire Grants, which would later become the state of Vermont. When the Revolution began in 1775, he joined the Green Mountain Boys militia and took part in the capture of Fort Ticonderoga. Later in the year, he became an adjutant with Col. Seth Warner's regiment in Canada, and was commissioned a second lieutenant in July of 1776. In an incident that would later be of great consequence on the floor of the House, Lyon was court-martialed for cowardice and cashiered after his company abandoned a fort on Lake Champlain due to the threat of Indian attack. Lyon was eventually reinstated and promoted to a captain. He also helped guide a retreat from Fort Ticonderoga to safety after realizing that the troops were in danger of running right into a British force and possible capture. In 1777, Lyon moved to Arlington, Vermont and resigned from the army the next year. Upon his retirement from the military, Lyon turned to administrative duties and took part in the convention that established the state constitution. He also served as assistant judge of Rutland County and deputy secretary to Governor Thomas Chittenden, meeting and later marrying Chittenden's daughter along the way. He was a member of the state house of representatives from 1779 to 1783 and for 10 of the years between 1783 to 1796. His other accomplishments included founding the town of Fair Haven in 1783 and building and operating several mills for iron casting, paper production, and timber sawing. Lyon, a stout anti-Federalist and member of the Democratic-Republican Party, made three unsuccessful bids for the House of Representatives between 1790 and 1794. In 1793, he established a printing office to start cranking out the Farmers' Library, which would later become the Fair Haven Gazette. Essentially, Lyon's reason for starting up the newspaper was to introduce more political opinion into the Vermont press, which was dominated by Federalist publications from surrounding areas. In 1796, Lyon was successful in winning a seat in Congress, then based in Philadelphia. Not one to spare words, he directly accused Alexander Hamilton, the Federalist leader, of "screwing the hard-earnings out of the poor people's pockets" so the government would be able to "vie with European Courts in frivolous gaudy appearances." One of Lyon's main targets was a ceremony borrowed from the British Parliament, in which the House sent a committee to formally request the President to address Congress. Lyon quickly became one of the main enemies of the Federalists. He was derisively called "the roaring Lyon of Vermont" and other nicknames, and openly mocked as he traveled through strong Federalist areas between Vermont and Philadelphia. After unsuccessfully trying to amend the practice of requesting the audience of the President so that any members who didn't wish to participate weren't compelled to do so, Lyon questioned whether he alone could be exempted; another member suggested that Lyon was insane and should be locked up while the rest of the congressmen visited the President. In one of his better-known speeches, Lyon said that it did not matter how well-born one was, but only how well they served the country. He said one of the reasons he did not support the ceremony was because he did not trace his ancestry to "the couriers of Oliver Cromwell, nor those who hanged witches, or punished their horses for working on Sundays." Among the Federalist attacks on Lyon was the story, almost certainly apocryphal, that he had been forced to wear a wooden sword as punishment after being cashiered from the army. Though Lyon could hold his own against the attacks on him, the slander on his military record proved a sore spot. In one incident in January of 1798, he was talking with the Speaker of the House during an off time in the deliberations and criticizing the Connecticut congressmen, saying their actions in the House were contrary to the desires of their constituents. Boasting loudly enough for the nearby Connecticut delegation to hear, Lyon said he would be able to foment a revolution of political opinion within six months if he were to go into the state with a printing press. Upon hearing this, Federalist congressman Roger Griswold of Connecticut asked Lyon if he would be wearing his wooden sword when he went there. After Griswold pressed the question, Lyon spat in his face. The incident was referred to the Committee on Privileges, making Lyon the first congressman to have an ethics complaint lodged against him. The committee determined that he should be expelled for "a violent attack and gross indecency." The House debated for two weeks the question of whether Lyon should be allowed to remain in Congress, with one member saying the nation would dissolve into civil war if that were allowed. The majority favored expulsion in a 52-44 vote, but did not carry enough support to make the two-thirds majority necessary to remove Lyon. Some congressmen suggested that a censure would be more appropriate, but ultimately no action was taken on that recommendation. The feud with Griswold was far from over, however. 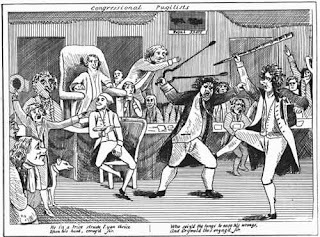 Seeking to take his own revenge, Griswold entered the House a couple of weeks after the vote and attacked Lyon with a hickory cane as the Vermont representative was seated at his desk. After sustaining a few blows to the head and face, Lyon managed to escape and get ahold of a set of fire tongs near the House fireplace. Most accounts say Lyon and Griswold both lost their weapons soon after, grappled for awhile, and then took a breather. The fight resumed when an ally of Lyon armed him with a hickory stick of his own, and Lyon got in at least one strike against Griswold as he stood near the a water table. Friends of Griswold moved to get the congressman his own weapon back, but the fight was finally broken up when the Speaker called for order to be restored. Newspapers on both sides went berserk. Anti-Federalists said Griswold had refused a duel challenge from Lyon and that it was a sign of Federalist cowardice. A Federalist paper in Connecticut threatened Lyon with tarring and feathering if he ever tried to enter the state. In the House, some exasperated congressmen said that both Lyon and Griswold should be thrown out. Though the Committee on Privileges supported the recommendation, neither side was very supportive. 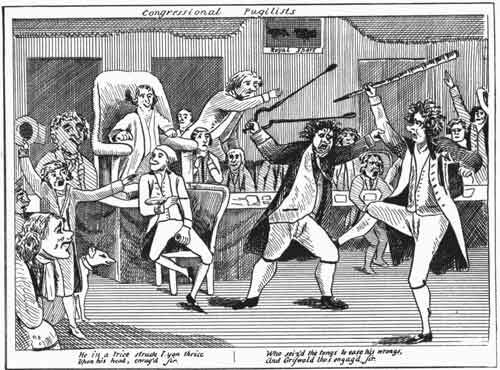 Federalists did not want to lose Griswold; Anti-Federalists argued that Lyon was an innocent victim in the brawl, and that it had not disrupted Congress because the House hadn't been in session at the time (an argument also employed in the first debate over Lyon's expulsion). A vote to expel the two members failed 73-21, and though a resolution to reprimand the two congressmen was immediately introduced the House narrowly decided against accepting the question, 48-47. 1798 was shaping up to be quite the banner year for Lyon. In the midst of increasing tension between the United States and France in that year, the Sedition Act passed. The law established penalties for encouraging riots or uprisings, or for forming groups to oppose government measures. The most controversial aspect made it illegal to publish any false or scandalous works intended to defame the government. Opponents of the law saw it as a transparent attempt to cut down on opposition pieces criticizing President John Adams or other government officials. Lyon predicted that he would be the first person arrested under the Sedition Act due to his unpopularity with the Federalists. In the summer of 1798, Lyon ensured he would meet his prophecy by publishing a letter in Spooner's Vermont Journal explaining why he rejected the idea of "Presidential infallibility." He criticized Adams' fast day proclamation, saying it used "the sacred name of religion as a state engine to make mankind hate and persecute one another," and that "every consideration of the public welfare was swallowed up in a continual grasp for power, and unbounded thirst for ridiculous pomp, foolish adulation, and selfish avarice." The letter also said decent men were turned out of office for independence of thought while yes-men were sheltered. Lyon also printed a letter from Joel Barlow, an expatriate in France, in response to a speech by Adams on the United States' relationship with France. Barlow wondered why the response to Adams' speech, which declared France's religion and morality at an end and suggested that the United States remain perpetually armed against the country, had not been "an order to send [Adams] to a madhouse." In addition to the two letters, Lyon launched a magazine entitled Scourge of Aristocracy and Repository of Important Political Truths, which declared its aim to be telling the truth and opposing the lies of the Federalist Party. Lyon was indicted in October of 1798 by a federal circuit court in Vermont, the first person prosecuted under the Sedition Act. The trial took place the same month in Vergennes, Vermont. The charges against Lyon were attempt to stir up sedition and bring Adams and the government into contempt; malicious publication of Barlow's letter; and assisting and abetting the publication of Barlow's letter. The prosecutors essentially let the publications stand on their own, but also showed that Lyon had been using the writings at public meetings in Vermont and in his political campaign for re-election to the House in the 1798 election. Lyon served as his own defense during the trial. He argued that the court did not have jurisdiction in the matter because the Sedition Act was illegal; that the publication was innocent; and that the contents spoke the truth. On the last contention, he asked the presiding judge, William Patterson, whether he had not "dined with the President, and observed his ridiculous pomp and parade." Patterson said he hadn't, and that the dinners were simple affairs. When Lyon asked him whether the President had more servants and pomp than the tavern at Rutland, Patterson apparently remembered his role as a judge and kept quiet. Oddly enough, the Chief Justice of Vermont at the time was Israel Smith, who had served in Congress for eight years before being unseated by Lyon. At the trial, Smith appeared as counsel for Lyon in the closing arguments, but declined to make a reply. Lyon ended up taking up the task himself, stressing the unconstitutionality of the Sedition Act. Patterson told the jury that they weren't to consider constitutionality and that the Sedition Act was law until it was declared null and void. After an hour, the jury returned a guilty verdict. Patterson told Lyon that he had no business violating the Sedition Act, considering he was a lawmaker and expected to remain within its boundaries. He considered "the reduced condition of [Lyon's] estate" a mitigating factor after Lyon claimed that he could only contribute $200 toward a fine because the depression of 1798 had seriously affected him. Patterson then surprised Lyon by unexpectedly including four months of jail time in the sentence, along with a $1,000 fine and payment of the prosecution costs. Patterson also warned that Lyon could spend more time in jail if the difference of the fine was not raised by the time the sentence expired. Federalist papers rejoiced in the conviction, declaring it a victory over "the unbridled spirit of opposition to the government" and the end of "the vile career of the beast of the mountain." Vice-President Thomas Jefferson, an anti-Federalist serving under Adams due to a quirk in the original electoral system, criticized the decision, saying it made federal judges "objects of national fear." Friends of Lyon quickly came to his aid, with some upstarts even vowing to break him out of jail. From his cell window, Lyon encouraged them to show their support at the polls instead; he was still a congressional candidate, after all. With the help of his son, Lyon began distributing letters from the jail to keep his campaign going, adding some criticism of his condition as well. In one letter, he complained of being thrown into a cramped and smelly cell usually reserved as a "common receptacle for horse-thieves, money-makers, runaway-negroes, or other types of felons." While still in jail, Lyon prevailed in the 1798 election with almost twice as many votes as his opponent. One year later, Vermont printer Anthony Haswell was charged with violation of the Sedition Act for accusing the Federalist marshal in charge of Lyon of cruel punishment and saying the government had appointed Tories who had been opposed to independence to government positions. Haswell was sentenced to two months in jail and a $200 fine. The remainder of the fine proved to be no issue. Lyon's constituents raised money to help pay it off, and Lyon also raffled off his property to raise money. Another fund was started in Virginia, and included contributions from future Presidents Jefferson, James Madison, and James Monroe. More than twice the amount necessary was collected in the course of these fundraising efforts, so Vermont and Virginia supporters each paid half the fine. Lyon was released from jail in February, in time to make it back to Congress to resume his newly elected term. He was warned that there might be efforts to prosecute him for sedition based on the letters he sent from the cell, but he claimed immunity from arrest as a congressmen en route to the capital. There, he was met with yet another expulsion attempt based on the conviction, as defenders argued that he had been unjustly prosecuted. The vote broke along party lines, with the 49-45 majority once again not meeting the necessary two-thirds majority. A Federalist paper angrily declared, "happy must the nation be where it is but a single step from the dungeon to the Legislature!" Lyon's survival in the House may well have affected the course of history. Though Lyon did not run in the 1800 election, the contest of note in that year was the Presidential race. When electors tied in their votes for Adams or Jefferson, the matter went to the House. It once again deadlocked there, with eight states in favor of Jefferson, six in favor of Adams, and two states, including Vermont, contested. The other representative from Vermont was a Federalist, but eventually absented himself from the deliberations at his uncle's request. Lyon promptly cast Vermont for Jefferson, giving him the majority necessary to become President. In early March, the terms of Lyon, Adams, and the Sedition Act all came to a close. Lyon immediately took advantage of the expiration of the law that had convicted him, sending a long, critical letter to Adams. Lyon declared that he was heading west, "where I have fixed for myself an asylum from the persecutions of a party the most base, cruel, assuming, and faithless that ever disgraced the councils of any nation." He berated Adams, saying he had not fulfilled promises, "expected a crown," bullied France and sought to involve the nation in war, and supported unconstitutional laws. "I hope and pray that your fate may be a warning to all usurpers and tyrants and that you may, before you leave this world, become a true and sincere penitent, and be forgiven all your manifold sins in the next," Lyon concluded. Lyon kept his word about moving west, heading to Caldwell County, Kentucky in 1801 and founding the town of Eddyville. He also started a newspaper and shipyard there, and was a member of the state house of representatives a year after arriving. Jefferson offered him a commisaryship in the Western Army, but he declined. In 1803, he was once again sent to the House and served there for eight years. He lost the 1810 election over his opposition to going to war with England, which would occur in 1812. Despite his opposition to war, Lyon nevertheless became involved with gunboat manufacturing to assist in the military efforts. Lyon's later life is somewhat unknown. He was appointed a U.S. agent to the Cherokee Nation in the Arkansas Territory, but sources differ as to whether it was in 1817 or 1820. He also ran to be a delegate to Congress from the territory, but sources also differ as to whether or not he was successful. Some say James W. Bates won that election, while others say that Lyon prevailed but died before he could take office. In 1822, Lyon died in Spadra Bluff, Arkansas; in 1833, he was re-interred in Eddyville, whose county was renamed Lyon County after Lyon's son, Chittenden Lyon. Five years after Lyon's death, Chittenden Lyon began serving in the House of Representatives and stayed there until 1835. In 1840, Congress ordered that the fine Lyon paid after his conviction be refunded to his heirs, with interest; four years later, they made the same provision for Haswell, the printer who had defended him. In 2001, Senator Jim Jeffords of Vermont invoked Lyon in a speech discussing his decision to leave the Republican Party and become an Independent. Vermont people had always been independent thinkers, said Jeffords, and "proudly elected Matthew Lyon to Congress, notwithstanding his flouting of the Sedition Act." Very well written and researched article. Great job. What a great man Matthew Lyon was. he account of the voting for President is not quite correct. Adams lost the vote of the Electoral College, which voted Jefferson 73, Aaron Burr 73, Adams 65, and some others. The vote in the House was between Jefferson and Burr, not Adams (see Journal of the House, 6th Congress 2nd session, pp 796-803). I'd be very interested in the source for your comment that Morris absented himself at the request his uncle - I've not see the reason stated before. Also, oft stated claim that Lyon "founded" Eddyville seems a bit of a stretch to me. It was established before he got there, though clearly his energies contributed to it's commercial development.